d = fdesign.halfband constructs a halfband filter specification object d, applying default values for the properties tw and ast. Using fdesign.halfband along with design method generates a System object™, if the 'SystemObject' flag in the design method is set to true. d = fdesign.halfband('type',type) initializes the filter designer 'Type' property with type. 'type' must be either lowpass or highpass and is not case sensitive. d = fdesign.halfband(spec) constructs object d and sets its 'Specification' to spec. Entries in spec represent various filter response features, such as the filter order, that govern the filter design. Valid entries for spec are shown below. These options are not case sensitive. ast — attenuation in the stop band in decibels (the default units). tw — width of the transition region between the pass and stop bands. Specified in normalized frequency units. By default, all frequency specifications are assumed to be in normalized frequency units. Moreover, all magnitude specifications are assumed to be in dB. Different specification types may have different design methods available. d = fdesign.halfband(spec,specvalue1,specvalue2,...) constructs an object d and sets its specifications at construction time. d = fdesign.halfband(specvalue1,specvalue2) constructs an object d assuming the default Specification property tw,ast, using the values you provide for the input arguments specvalue1 and specvalue2 for tw and ast. d = fdesign.halfband(...,fs) adds the argument fs, specified in Hz to define the sampling frequency to use. In this case, all frequencies in the specifications are in Hz as well. Create a default halfband filter specifications object. Create another halfband filter object, passing the specification values to the object rather than accepting the default values for n and ast. For another example, pass the filter values that correspond to the default Specification - n,ast. This example designs an equiripple FIR filter, starting by passing a new specification type and specification values to fdesign.halfband. In this example, pass the specifications for the filter, and then design a least-squares FIR filter from the object, using firls as the design method. 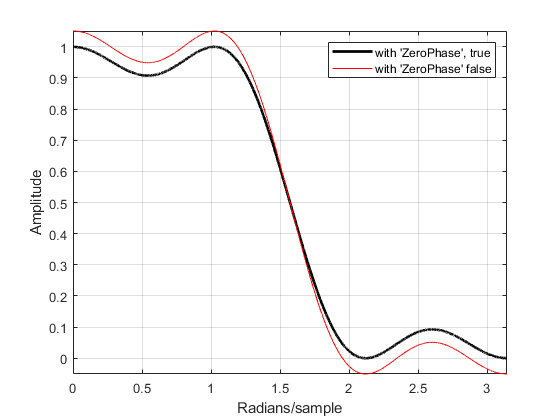 Note that the amplitude of the zero phase response (black line) is nonnegative for all frequencies. The 'ZeroPhase' option is valid only for equiripple halfband designs with the 'N,TW' specification. You cannot specify 'MinPhase' and 'ZeroPhase' to be simultaneously 'true'.